The Document Library is the heart of SharePoint, and managing it properly simplifies an admin’s tasks. That said, it is easy to feel overwhelmed at the sheer number of options that the platform provides. That’s why we have listed here the best practices that are easy to follow for admins, and offer maximum returns in the form of reduced hassle. Check out is supported by SharePoint document libraries, but not enabled by default. If multiple users access a document library at the same time, and that too on a frequent basis, then enforcing check out can help them keep track of which documents are being edited and by whom. Also, adding a Checked Out By column to the default view of the document library is a good idea. While anyone can hover the mouse pointers over the Checked Out icon and see in the tooltip which user is currently editing a document, it is not exactly an intuitive action. Adding the column will let anyone see the current user of a document at a glance, and simplify administration as well. Also, it is essential to train users on how to check out and check in documents, as well as how to discard check out. Versioning can be a powerful tool in the hands of SharePoint administrators, considering how easily it lets them roll back documents after a botched edit or data corruption. Every time a document is edited, no matter how little, SharePoint saves a copy of it automatically, which administrators can recover if necessary. However, the only problem with versioning is that it saves the entire file every time it is edited. Over time, this can gobble up storage space, especially if there are several large files stored in SharePoint. So, if versioning is enabled, then it makes sense to also set a limit on the amount of disk space that SharePoint will use, to ensure only the most recent versions of a document are stored. Setting up content types for different types of documents that exist in a library and uploading templates for them can simplify document creation and reduce the risk of technical issues cropping up. All users need to do is click on the NEW button and select the document type. A new document will be automatically created and launched, with the help of the preloaded template. This can also simplify administration, as admins can update the templates any time, and every document created after that would reflect those updates. 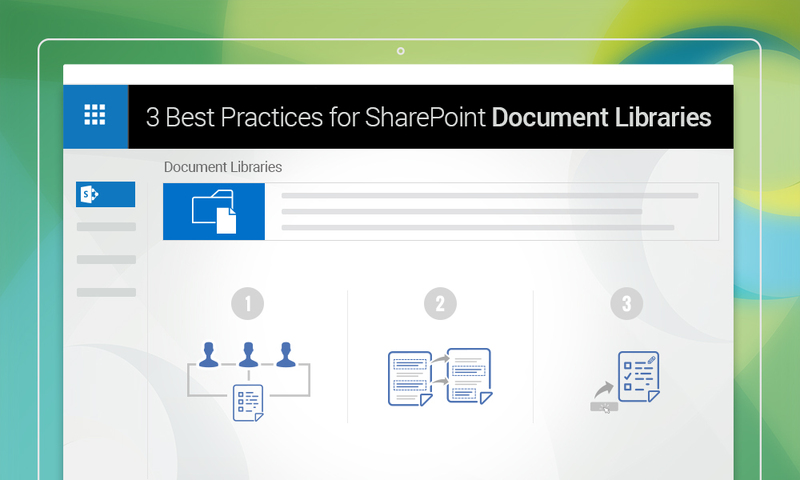 These three best practices can help admins manage SharePoint document libraries better, and that too, with less hassle. Following them can also help users be more productive with SharePoint. Good observations. Note that as of SP 2013, differential versioning reduces the space required for historic versions. This however does not nullify the best practice of limiting the number of major and minor versions to retain. Hi Toby, thanks for your input. Yes, differential versioning is indeed useful, especially for large files, where duplicating the whole document would quickly use up a large percentage of available storage space.